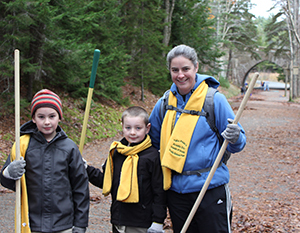 Each fall, hundreds of enthusiastic volunteers descend upon Acadia’s historic carriage roads to rake leaves and clear drainage ditches from miles of carriage roads in preparation for winter. The well-coordinated volunteer effort, now in its twenty-seventh year, focuses on areas where clogged drainage ditches and culverts could result in significant damage to road surfaces during the freeze-and-thaw cycles of a coastal Maine winter. Perhaps the most important volunteer event of the year in Acadia, Take Pride in Acadia Day is key to the park’s ability to maintain the carriage roads in pristine condition. We hope you’ll join us! After the morning’s work, crews will return to park headquarters for a hot lunch—the event’s traditional “CCC” meal of chili, cornbread, and cider (plus an extra “C” of cake). For more information contact Dana Petersen at dana@friendsofacadia.org or 207-288-3934, the Friends of Acadia Stewardship Coordinator. 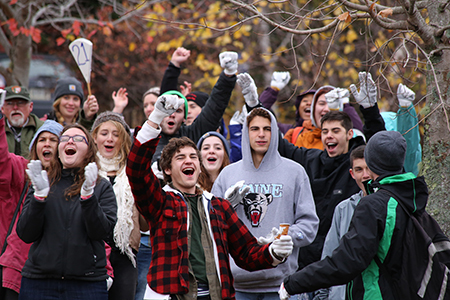 University of Maine Orono volunteers should contact Lisa Morin at the Bodwell Center, 207-581-4194 or lisa.morin@maine.edu.